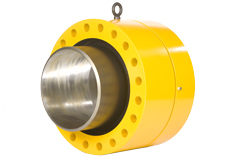 The Oil States FlangeMate Misalignment Connector is a highly engineered product that facilitates the connection of flanged tie-ins for underwater pipelines. The FlangeMate allows for 10 degrees of angular misalignment (20° total misalignment), bolt-hole alignment and metal-to-metal sealing. Metal-to-metal sealing is repeatable and can be verified via an annulus test port. See the FlangeMate connector animation here. See spoolpiece repair animation here. Angular misalignment of 10° (20° total misalignment). Bolt-hole rotation aligns bolt holes with those of the weld neck flange to facilitate quick makeup. Repeatable metal-to-metal seal that can be verified via annulus test port. Enhanced wiper seal system to isolate the metal sealing area from contaminants. Designed to accommodate high-capacity flange spreader loading.